Want to who will win today? In Today’s Dream11 Fantasy Cricket Prediction KKR vs KXIP 44th T20 Match IPL 2018, We will cover playing 11, Pitch report of Holkar Cricket Stadium, Indore, toss Prediction. We will also give you tips and tricks of fantasy leagues, weather report of Indore, players recent form, all the latest news and updates of Kolkata Knight Riders and Kings XI Punjab, where to watch the live match of KXIP vs KKR and details of live streaming. All the details in this post are taken from very reliable sources. Make sure to read the complete post to get 100% benefit. All the details in this post are completely Free. Each and every section contains some important information so read the post carefully. Where Can You Watch the Live Streaming of KKR vs KXIP or Channels to Watch? Who Will Win the 44th Match of IPL 2018 Between KXIP vs KKR and Toss Prediction? Date: The match will be played on 12th May 2018 (Saturday). Match: Indian Premier League, KKR vs KXIP, IPL 2018. Time: 10:30 AM GMT, 08:00 PM IST. The pitch of Holkar Cricket Stadium has behaved differently in this season of IPL. Before the pitch was flat and was a batting surface. Today the pitch may behave the same way as it did in the previous matches. All the department will get something from the pitch. On 12th May, it is expected that most of the time it will be a sunny day and the sky will be clear throughout the day. There is no sign of rain today. The temperature is expected to be 41-Degree Celsius and the humidity to be 15%, which may rise up to 20%. In the last five matches, KXIP won two matches out of five matches whereas KKR won three games out of five games. In overall encounters, Kolkata Knight Riders won 14 matches and Kings XI Punjab won 8 games. At this venue, KOL has won 7 matches and PUN won 5 matches. Star Sports has paid a huge amount of INR 16,347.50 Crores to get exclusive rights of IPL 2018 for live coverage for five years starting from 2018 to 2022. Star Sports has all the media rights including TV and all Digital Rights. You can watch the full match of Kings XI Punjab vs Kolkata Knight Riders, 44th match on Star Sports. Ravichandran Ashwin (c), Manzoor Dar, Lokesh Rahul (wk), Mujeeb Ur Rahman, Chris Gayle, Yuvraj Singh, Karun Nair, Mayank Agarwal, Akshdeep Nath, Ben Dwarshuis, Manoj Tiwary, Mayank Dagar, Mohit Sharma, Marcus Stoinis, Barinder Sran, Pardeep Sahu, Axar Patel, Ankit Rajpoot, Aaron Finch, Andrew Tye, David Miller. Sunil Narine, Ishank Jaggi, Dinesh Karthik (c & wk), Kuldeep Yadav, Chris Lynn, Cameron Delport, Andre Russell, Robin Uthappa, Apoorv Wankhade, Shivam Mavi, Shubman Gill, Javon Searles, Tom Curran, Nitish Rana, Vinay Kumar, Prasidh Krishna, Rinku Singh, Piyush Chawla, Mitchell Johnson. In this section, we will provide you with the playing 11 of both the teams. Chris Lynn, Nitish Rana, Andre Russell, Tom Curran/Mitchell Johnson, Kuldeep Yadav, Sunil Narine, Robin Uthappa, Dinesh Karthik (capt & wk), Rinku Singh/Shubman Gill, Piyush Chawla, Prasidh Krishna/Shivam Mavi. Chris Gayle, KL Rahul (wk), Mujeeb Ur Rahman, AJ Tye, Axar Patel, Manoj Tiwary, Karun Nair, Mohit Sharma, Ashwin (capt), Marcus Stoinis, Akshdeep Nath/Yuvraj Singh. KKR have won most of the matches in the previous IPL but KXIP won the last two matches. Cricket experts predicted that Kolkata Knight Riders will win the match but according to our astrology prediction King XI Punjab will win today’s match. The team winning the toss to opt to bowl first as the team who chased have won all the matches in Holkar Cricket Stadium. According to our astrology prediction, KXIP will win the toss and opt to bowl first. 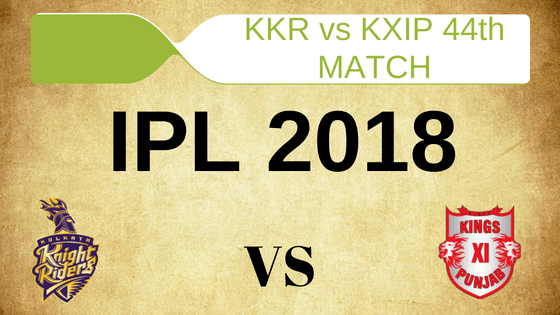 Conclusion: This is it for Today’s Dream11 Fantasy Cricket Match Prediction of KXIP vs KKR, 44th T20 Match, IPL 2018 which will be played on Saturday 12th May. You can give your valuable feedback in the comment section. Subscribe to our notification of latest updates. GOODBYE!